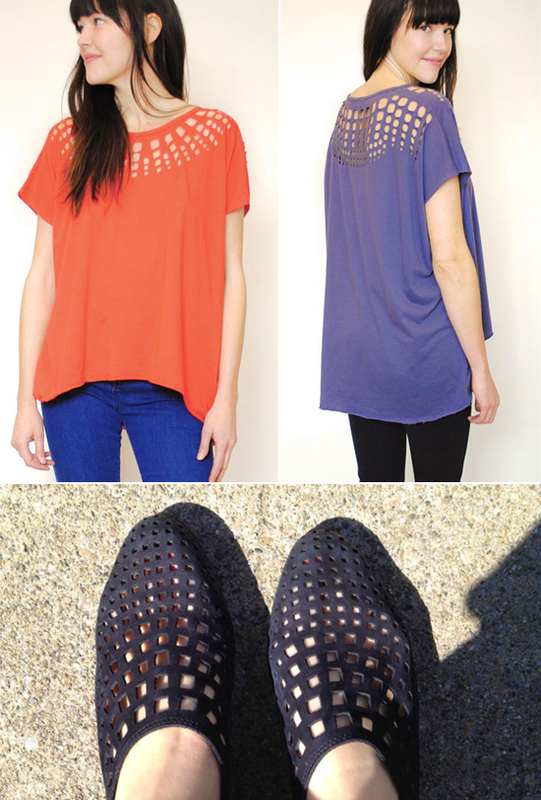 I love this new laser-cut top by the Curator duo. Stacy and Deirdre have been designing and producing their collection in San Francisco since 2001. Last year, they were having a "design stump" (we've all been there, right?) and Deirdre kicked up her feet (literally) and said to Stacy, "we should try something like this on a t-shirt." Stacy got to sketching, then came the designing, prototyping & sourcing, and the result is the laser-cut (organic cotton/made in San Francisco) Kimmie tee. I really REALLY like those tops with the interesting cut outs. Gorgeous!